Lights are the easy, maintenance free solution to indoor area lighting needs in household and commercial applications. The LED wrap ceiling light is a great replacement for your flourescent version fixtures, and provide a cost-efficient choice. 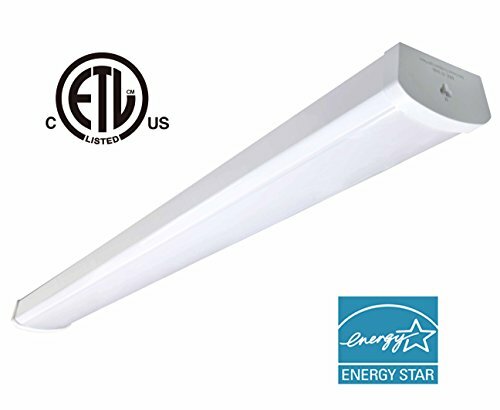 Energy saving - Efficient LED delivers 4000 lumens using just 48watts of energy. Easy and fast installation - Can be surface mounted to walls and ceilings, Hassle-Free Mounting. High Efficacy LEDs - Provide long-lasting, efficient performance with uniform light and color distribution. Widely used in home, hallways, closets, stairwells, kitchens, offices, garages, under cabinet and commercial spaces. Energy savings of up to 65% over a lifespan, provides 50,000 hours of maintenance-free operation. These Linkale LED Wrap Ceiling Fixtures can be surface mounted to walls and ceilings, mounting hardware included, NO BALLAST TO EVER REPLACE! Our Integrated LED Wraparound Lights perfect for offices, workbench, home, kitchens, closets, stairwells, basement, garage, under cabinet and commercial spaces. ETL and Energy Star Certified for performance and saft operation. 5 YEARS WARRANTY -unlimited warranty means we got you covered. Easy and fast replacement is offered if any quality issue. Turns on instantly, thermal formed diffuser crafted of highly transmissive material to minimize lamp image. If you have any questions about this product by OOOLED, contact us by completing and submitting the form below. If you are looking for a specif part number, please include it with your message.